1. Experiencing Results – Every Growth Cycle SM starts with real world experience. Being open to the reality of our world, gathering information, paying attention to outcomes, and getting input and feedback from others are all part of experiencing the results we want (our vision). The only way we can know if we are making progress and turn our vision into reality is by being open and objective along the way. Think about successful leaders and creative people. More than likely, they have lots of ways to get feedback about how they are doing and periodically seek input from others — even when the results don’t match our expectations. We are all born with the natural ability to listen and be open to the world — and evaluate our progress. This is how we learn from our experience and turn early trial and error into ultimate success — turning our vision into reality. 2. 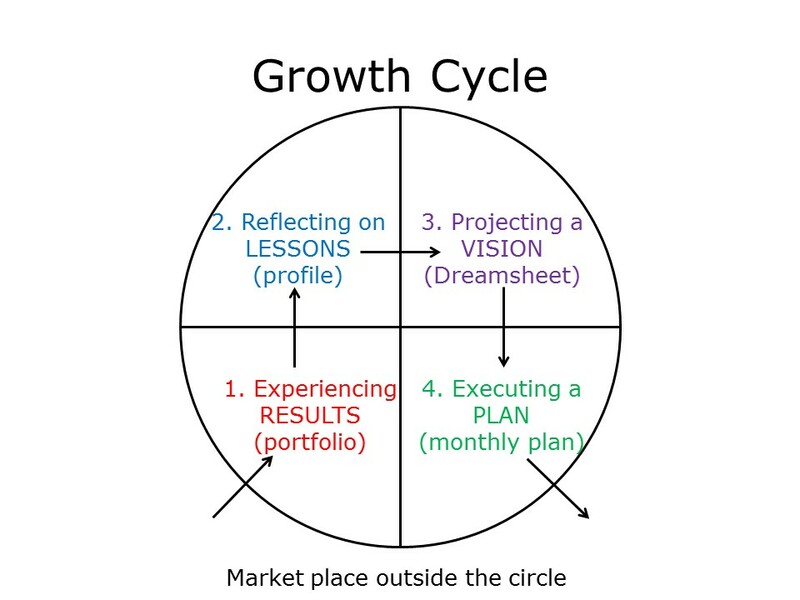 Reflecting on Lessons — Every Growth Cycle SM requires personal reflection at times — becoming more aware of our knowledge, experience, skills, values, beliefs and assumptions that make us unique. We tend to take for granted what we bring to the table — and often aren’t aware of what we’ve learned. Sometimes we get results that don’t match our prior experience. Letting go of assumptions or beliefs that don’t accurately describe the world or ourselves can be difficult — but this always precedes our biggest breakthroughs. Think about successful leaders and creative people. More than likely, they have a very clear understanding about who they are — and how they can make a difference. They often question their assumptions and beliefs because they trust in their ability to form new ones. We are all born with the natural ability to be introspective and think about our past — and learn from our experience. 3. Projecting a Vision — Getting clear about who we are leads to clarity about what we really want (our vision). This is a description of the future we want to create. The more our vision “connects the dots” of our past experience, the more meaningful it will be to us — and others — and the more likely we will be successful in creating it. While visions usually start out very fuzzy — and are just a “best guess” or hypothesis of what we can achieve, they get clearer over time. Like us, they are a work in progress. Think about successful leaders and creative people. More than likely, they’ve developed a clear understanding about what they want. We are all born with the natural ability to envision and think about our future — and project a positive vision of what we really want. Even a glimpse of a vision that is meaningful to us can help us create a long term focus that leads to specific action — and real learning. 4. Executing a Plan — While a vision answers the “what” question, a plan answers the “how” question. It is a description of the actions we will take over a specific period of time to move closer to our vision. There are always multiple ways to turn our vision into reality. Crossing the threshold from thinking about our vision to taking action can be scary — but is essential to move forward. Think about successful leaders and creative people. More than likely, they are always taking action that moves them toward their vision. We are all born with the natural ability to take action and affect the world around us — and overcome obstacles. Having a specific plan in mind can focus our energy and ensure we are always moving forward. Getting out of our head and into the world is the only way for good things to happen.